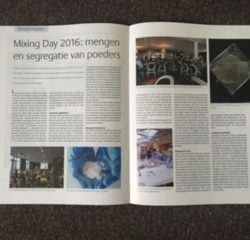 In its May 2016 edition, number 3, the Dutch magazine “BULK Solids Processing & Handling” features an extensive review of the Mixing Day 2016, organized by Delft Solids Solutions in Nootdorp, The Netherlands, on April 5th 2016. The image below links you to the on-line edition of the respective article (in Dutch). Enjoy reading!